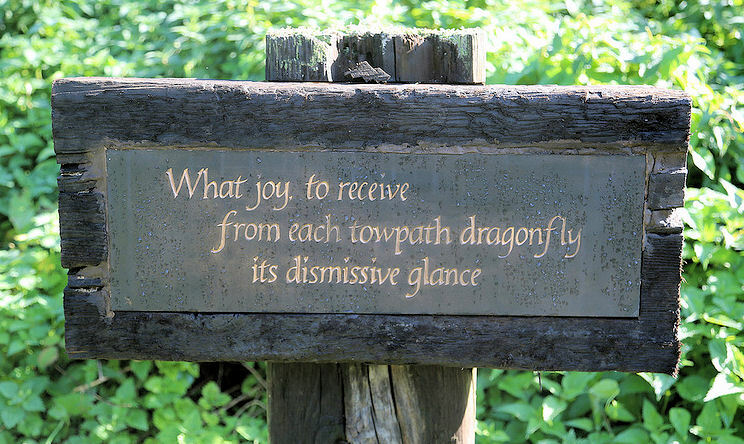 Last year two local artists, poet-painter Paul Russell Miller and stone carver Jim Pentney collaborated to produce a hand-lettered haiku poem in slate inspired by a summer canal side walk. Originating in Japan over six centuries ago, haiku is now being written in an ever increasing number of countries and different languages, making it perhaps the world’s most widespread, as well as its shortest, poetic form. For his own English-language versions Paul uses a traditional seventeen syllable structure, arranged in three lines of five, seven and five syllables respectively. He regards his haiku very much as 'nature poems' attempting, through them, to re-create brief often seemingly insignificant experiences which nevertheless reverberate with meaning. Introduced to stonework by the distinguished British letter-carver and designer Tom Perkins, Jim is also a narrowboat owner and waterways enthusiast. He has contributed several other hand-carved pieces to the Canal Trust, making use of derelict and discarded stone as part of the process. Last summer’s collaboration has now grown into a soon-to-be-completed series of five haiku stones, each one sited at a different towpath location somewhere between Wallbridge and Daneway. It is hoped that they will be encountered and enjoyed there in much the same spontaneous way as the wildlife subjects they celebrate.